Hi! This is Manda & Shanda from Twin Speech. We are happy to be back at Speechie Freebies this month! One of our favorite holidays is just around the corner - Valentine's Day! We want to spread the love a bit and give away a freebie to our followers and friends. If you head over to our Twin Speech, Language & Literacy LLC Teachers pay Teachers store, you can download it right away. 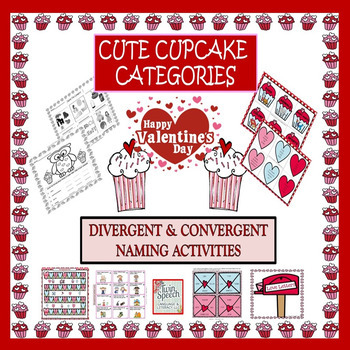 Our little Valentine treat for you is called, "Cute Cupcake Categories." It works on the skills of divergent and convergent category naming and we hope it is a sweet way for you help improve the language area of categorization with your students. This freebie is a sample of a larger resource of ours that also works on the skills of categorization with students from the pre-k level to third grade. The packet is filled with a large number of fun and interactive games, activities , worksheets and also contains both fun colored pages and ink-saving black and white sheets. Just pick and choose your activity and have a super fun time improving categorization skills in your students now and all of the way through the month of February! Have a super sweet Valentine's Day everyone.